Among many small family traditions during the holiday season, my wife and like to watch “National Lampoon’s Christmas Vacation” at least once or twice between Thanksgiving and Christmas. This year we also through “Planes, Trains, and Automobiles” into the mix. These are two classic movies, with relatively clean humor, that really encapsulate the “whole” season – not just the fun parts, not just the happy parts, but also the excruciatingly “real” and frustrating parts. This year though, something jumped off the screen and hit me in the face. Or, maybe I should say something that wasn't there did. Both of these movies were made in the 1980s - 1987 for the Steve Martin/John Candy Thanksgiving classic and 1989 for the Chevy Chase Christmas installment of the Vacation series. Back in the late eighties, here are the things you didn't see in the movies – no cell phones, no smart phones, no pagers, and no laptops. There weren't any digital cameras taking photos of everything. People weren't constantly checking their email or Facebook. They weren't constantly posting on Twitter or Instagram. Instead, if you were out and about and needed to communicate with someone – anyone - you made a phone call, and to accomplish even that simple task you needed to find a pay phone and have the change to drop in the coin slot. People showed up unannounced. People didn't know where everyone else in the family was at all times. Soon after these movies were made I went off to college in 1990. That's where I first saw someone with what could be called a modern hand held cell phone. There was one guy, and from what I can remember only one guy, who had one of these things. He walked around the campus with that phone constantly glued to his ear. Who he could be talking to was anyone's guess, but he certainly thought being the only person with the latest technology was something of a status symbol. The point being that just 25 years ago there was only one guy on that entire college campus with a cell phone and now if you go there they will be ubiquitous. However, instead of actually talking to other people, most of today's college students will be rapid fire texting or posting their latest activity to one of the many options on social media. The irony is that as the ability to connect with other people has grown because everyone now has the technology, the actual connecting with other people has decreased because we don't even talk any more. The idea of the rapid pace of change taking its toll on us was the focus of Reverend Jody Seymour’s sermon a few weeks ago at Davidson United Methodist Church. In his sermon, Reverend Seymour mentioned something called the Law of Accelerating Returns. When it comes to technological change this law states that change is exponential, not linear. Extrapolated over the course of an entire century, it means we will experience 20,000 years worth of change in the 100 years of this century. When I think about that lone cell phone user just 25 years ago and compare it to the communications technology we have now, it's not hard to believe. It is also a little bit daunting to ponder the implications. So with that in mind, this is my New Year’s Resolution. I am going to pick one day a week where I don't use any technology that didn't exist in the movies “Plains, Trains, and Automobiles” or “Christmas Vacation”. The one exception can be work related email but that will be kept to a bare minimum after hours. The goal is not a test of willpower to see if I can do it, but a conscious attempt to just slow down and ponder how fast life can be these days. It will be an attempt to ensure that ever increasing speed doesn't cause me to steamroll my way through life this coming year. We’ll see how long it lasts! This story first appeared in this week’s Herald Weekly at huntersvilleherald.com. One of the first posts at aShortChronicle to get significant statewide traction was one called HOT Lanes: The Empire Strikes Back. It recounted the story of how activists from WidenI77.org trekked to Raleigh in 2013 to meet with then-Speaker Thom Tillis. They hoped to avoid a long confrontation by convincing the elected official most responsible for the I77 HOT lanes project to change course. It did not work out that way. Rather than engaging in a productive meeting, the pro-toll Empire attempted to crush the Rebels through a display of overwhelming force. Well, nearly three years later, history seems to be repeating itself with Team Tillis releasing its Storm Troopers from across the state and beyond to engage anti-toll activists in the battle for cyberspace. Recently, the anti-toll Rebels engaged the Senator's proxy (aka his wife, Susan Tillis) when she posted in the LKN Election Connection forum on Facebook. Ms Tillis, posted a glowing bit of commentary about the Senator's work in the area of Veteran's affairs - good work to be sure. However, it was almost immediately met with comments on tolls, underscoring how the Senator's support for tolls has poisoned the well for him among many locals. Team Tillis, aided and abetted by one local journalist, engaged in a day-long running back and forth over tolls totalling nearly 300 comments while simultaneously feigning indignation that the anti-tollers had somehow "hijacked" Ms Tillis's Facebook thread. Team Tillis members Carmen Cox Ledford from Sanford North Carolina and John W Turner of Raleigh were imported to the battlefront to do the heavy lifting. Ms Ledford is a long-time Republican Party activist. 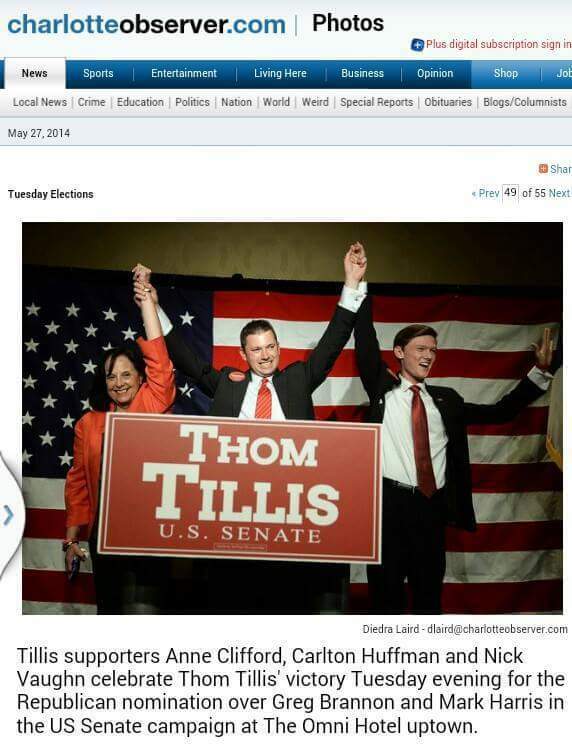 Her online footprint shows numerous pics of her and Ms Tillis as well as the Senator. The same goes for Mr Turner online profile. In fact Turner introduced himself to the local debate with this comment on the LKN Election Connection Facebook Group. It would appear for him, conflict was a foregone conclusion. To be very, very clear...it appears both of these people have done lots of good work particularly in the area of veterans affairs and education choice. They should be commended for those efforts. In this case however they seem to be playing the role of the "good soldier". Unfortunately, when it comes to defending those who defend this toll plan, this time they've gone over to the Dark Side. The same niceties can not be said for this third example. Huffman hails from Granite Falls, NC and currently works for the state GOP in Wisconsin. He is also no stranger to causing political turmoil. As a former legislative aid in Raleigh, he was involved in at least two controversies during his short time there. In one case, he circulated emails poking fun at some grammatical errors of children trying to participate in the legislative process. In another he anonymously placed a controversial letter on desks in the NC Senate chamber as the Senate was about to debate a bill. Check out this story and its embedded links for more details. Soon after these incidents, Huffman no longer worked at the NCGA. Huffman is also no stranger to meddling in the affairs of other localities. This profile of Huffman's activities when working on a political campaign in the Hickory area is revealing. Highly suggest reading it and its links. Frankly, Team Tillis should be distancing itself from this guy. The fact that they aren't is telling. For those pesky activists in the Rebel Alliance however, there is one point to take away from seeing the Empire bring so many from "lands far, far away" to this fight. It's an example of how little support the pro-tollers have locally to engage the fight themselves. To those pesky Rebels engaged in that fight, "may the force be with you." A few weeks ago, we told you about a number of bright red flags in NC-95 Rep John Fraley's initial campaign reports when he ran last cycle. receiving a large donation from the family of Mayor Chuck Travis - a long standing supporter of the I77 toll project and a board member of the state's tolling authority. As bad as that list is, unfortunately there's a bit more. 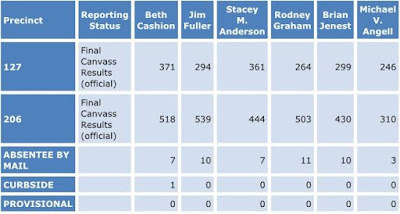 When Rep Fraley filed his year end campaign report in 2013, the first major report he filed, he served as his own campaign treasurer and did a very thorough job of capturing the required information from donors. Maybe too good for some people's liking. 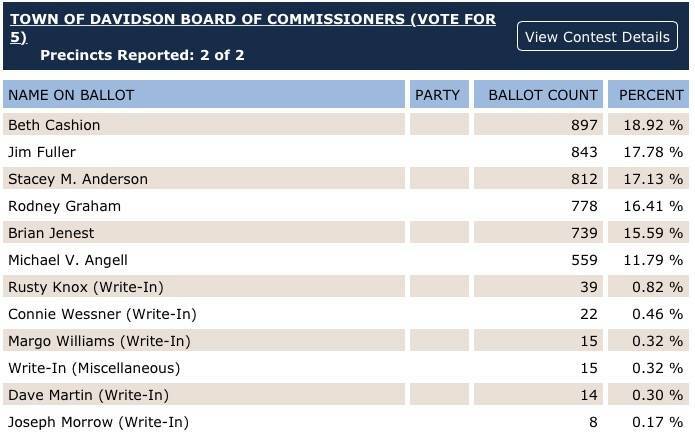 The State BOE website shows that in April of 2014, the Fraley Campaign filed an ammended report. At first glance that April ammended report looks intended to just correct a couple of minor accounting errors. A few dollars here and there are recategorized, nothing unusual. However, one also notices the contact info on the donor list has also been "updated". As previously mentioned, while serving as his own treasurer, Fraley had been very thorough. Nothing was missing as far as contact info for donors goes. For a first time report, that was actually pretty impressive. The interesting thing about the updated report is that it actually removed info. Every donor was reformatted and had some of the not required info provided in the original report struck from the report. One donor had a bit more than that taken off. Want to guess which one? 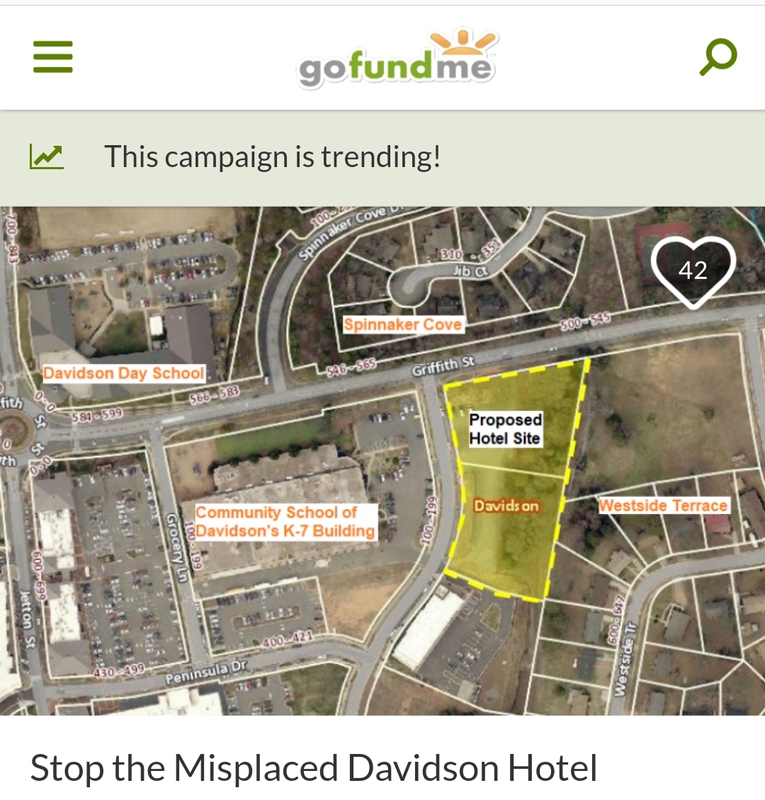 Out of 50 donors, only the donation from the family of Cornelius Mayor Chuck Travis had more info removed. Instead of the required address info it now just said "NC" - an error that does not meet the minimum standard. Typically, ammended reports correct errors. They don't introduce them. Plus, when the only introduced error makes it more difficult to identify the source of a potentially embarrassing contribution, that is certainly something that makes one go "hmmm...". One tried and true "explanation" for this type of thing is to throw the campaign treasured under the bus. Often campaign treasurers are the candidates themselves or other people who may not do these things for a living. It is believable for them to admit a mistake and beg forgiveness. However, that tactic would not really work in Rep Fraley's case. 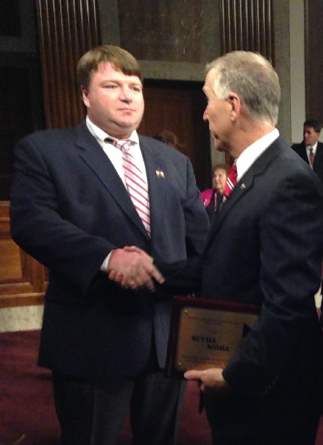 You see, in February of 2014 Fraley changed his campaign treasurer from himself to one Collin McMichael. McMichael signed the ammended campaign form with the eror. Who is Collin McMichael? He just happens to be the professional campaign finance accountant used by many of North Carolina's Federal Republican candidates. According to OpenSecrets.org, McMichael's firm, CM&CO LLC , received $291,181 for its Federal work alone in the 2014 election cycle. Who was CM&CO's largest customer that cycle? That would be the Thom Tillis campaign. That's the same Thom Tillis who is the godfather of the I77 HOT lanes plan, the same Thom Tillis who appointed Mayor Travis, whose wife made the donation in question, to the state Turnpike Authority, and the same Thom Tillis who had the dustup with former NC95 Rep Robert Brawley over the toll issue just before Fraley decided to primary Brawley last cycle. A high-dollar campaign finance accountant makes a "mistake" by removing information on a donation that could raise a few eyebrows. It occurs around a highly volatile issue, and the people involved all have connections back to Senator Thom Tillis. It could all be just an innocent coincidence, but it certainly is one of those things that make you go "Hmmm..."
The Charlotte Observer reported Friday on what may be the first highway stoppage due to an accident related in some way to the HOT lanes project and the new Jersey Walls in place since construction started. 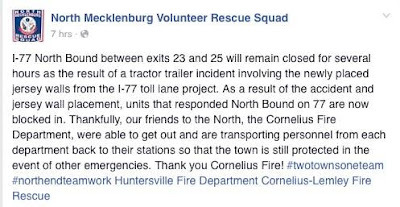 "Northbound Interstate 77 is shut in Huntersville early Friday afternoon after a tractor trailer jack-knifed just north of the Gilead Road exit, firefighters said. The wreck happened around 12:30 p.m. near Exit 23. State highway officials said it could take until 4 p.m. to clear the scene." Where is the mention of the HOT project you ask? That info comes from Facebook via the actual first responders on the scene. 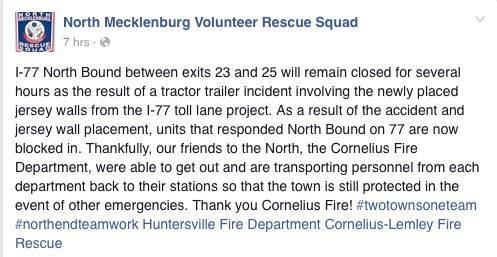 I happened to be driving a mini-bus on I77 very early Friday morning before this happened. It was my first time doing so since the lanes have been narrowed for the HOT lanes project. Let me just say for large vehicles, these narrowed lanes leave little to no room for error. Back in the day, I used to have a commercial licence and drove city buses and large box trucks. I can tell you, these lanes are tight! If this project continues going forward, get used to more of these accidents. They will continue to happen. End a big week with your comments to CRTPO! This Monday, the anti-toll movement put a big exclamation point on last month's elections. At the swearing-in ceremonies in Huntersville and Cornelius the newly sworn Boards ratcheted up the pressure against the toll project. 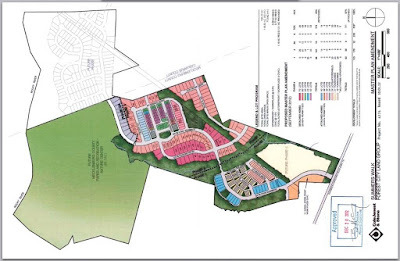 In Huntersville, after an historic election that saw the defeat of an incumbent Mayor and two incumbent Commissioners based largely on their support of the I77 HOT lanes project, the new Board unanimously passed a strongly worded resolution asking that the contract for the project be “terminated”. The resolution included 13 different reasons, or “whereas” clauses, for requesting NCDOT terminate the contract. 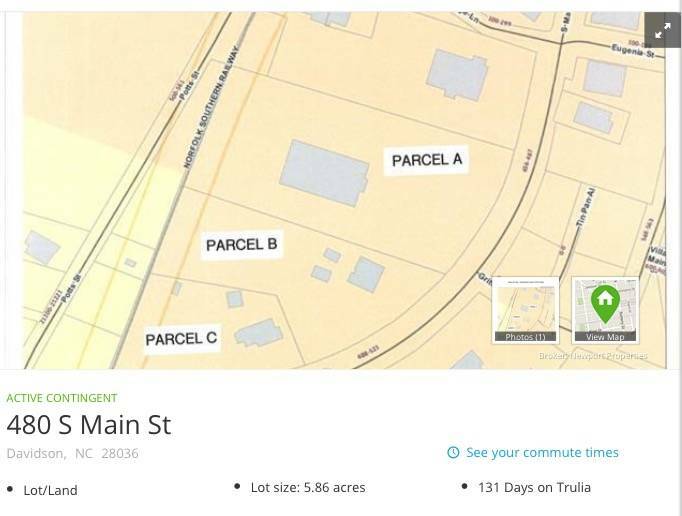 In Cornelius, things were a bit more personal with the new Board apparently considering a resolution criticizing Mayor Chuck Travis’s quasi-official actions supporting the project in contradiction to the Board majority’s long standing opposition to it. A vote on a resolution was deferred, but even considering it as one of the new Board’s first items for discussion sends a clear message. However, even with these strong moves, not everything has been going smoothly for the community effort to defeat the tolls. The details behind the previously announced “Select Committee” in the NC House to discuss the subject were released last Friday. Those details failed to inspire confidence that the Committee will lead to any quick action. The committee is made up of 20 members and has a charter to look at all sorts of transportation issues, not just the I77 project. It also includes members of who are known supporters of the HOT lanes such as Mooresville Rep John Fraley. Also, the recent “I77 Summit” held in Cornelius in late November failed to draw Governor McCrory’s attendance. 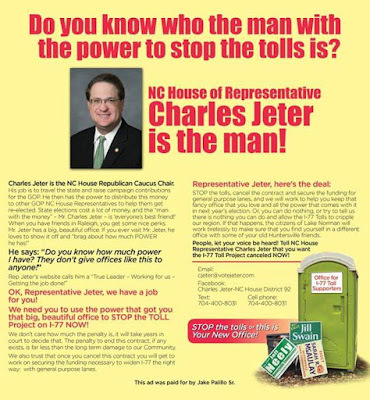 Instead, he sent the usual suspects from the NCDOT to rehash their same talking points. He also continued to hide behind the actions of the region’s main transportation planning body, the CRTPO - saying only that body had the authority to cancel the project – a position which would seem to undermine his own authority as Governor. So, while clearly the local opposition is gaining steam there is just as clearly much more work to do if the powers that be in Raleigh are to be convinced this project needs to be re-thought. As luck would have it, an opportunity for citizens to contribute to that work is currently underway. Every four years the Federal Department of Transportation reviews how the various regional Metropolitan Planning Organizations are doing. In this area, that body is the Charlotte Regional Transportation Planning Organization, or CRTPO. The public comment period for this quadrennial review of the CRTPO runs through next Wednesday, December 15th. Local citizens should have plenty to say regarding how the body has handled this issue. Who can forget former Huntersville Commissioner Sarah McAulay serving as the CRTPO Chair and unilaterally shutting down toll opponents during the public hearing on the HOT lanes? Her actions as the Chair of the body in general as well as during this public hearing specifically have a great deal to do with why she is a “former” Commissioner. Who can forget the CRTPO ignoring over 700 comments opposing the project before the body voted to approve it? Defying common sense, the CRTPO actually approved a toll project without giving the public any clear idea what the actual tolls would be. 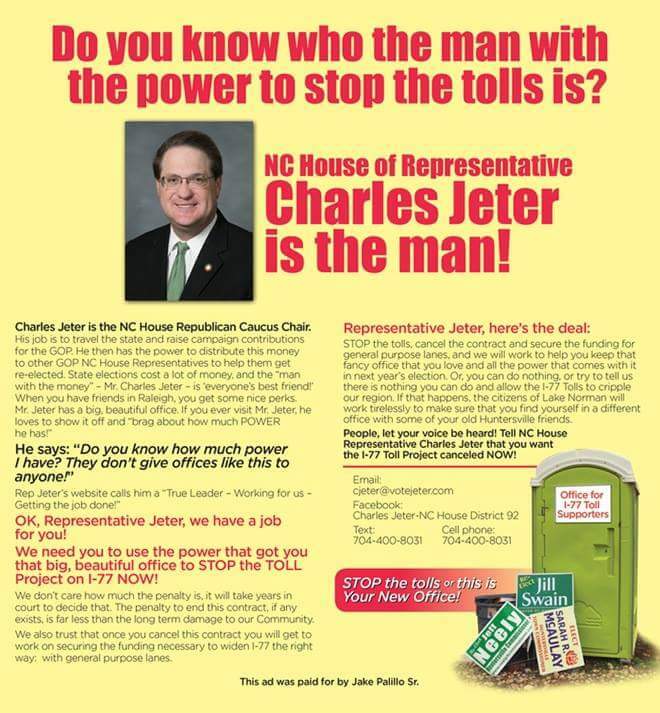 Who can forget Charlotte – which holds a near majority of the votes on the CRTPO - snubbing the Lake Norman area municipalities and not even bothering to attend the recent “I77 Summit”? The City’s actions show a clear problem with how CRTPO is structured in that Charlotte really does not have to listen to the other members, and city leaders have proven they won't. The November press release from CRTPO says the Federal review is to ensure it “follows a continuing, cooperative, and comprehensive transportation planning process.” Based on the above examples, the body sure seems to fall short on at least a couple of those points. To provide your own comments, send an email to Loretta.Barren@dot.gov with the Federal Highway Administration by December 15th. Late Friday afternoon, Mollie Young (Dir. of Communications, Speaker Moore's Office) sent out a press release finally announcing the formation of the Select Committee within the NC House mentioned by the Speaker back on November 16th. The details in the press release should temper any optimism to a great degree that this committee will quickly achieve the desired result. The committee is Chaired by John Torbett of Gaston County. Torbett has been a good soldier for the pro-toll forces in the House. Torbett was a co-sponsor of an earlier toll related bill H267. We've covered the shenanigans around that bill extensively. See here, here and here for a sampling. Having Rep Torbett with his hand on the reigns of this Committee should not give the anti-toll crowd a warm fuzzy feeling. This is the same Rep Torbett who "forgot" to file any campaign reports this entire year and recently had his campaign committee temporarily shut down by the State BOE. As further evidence this Select Committee is not stacked with anti-toll politicians, you'll find Rep John Fraley's name also on the list. Fraley is pro-toll all the way as we told you about here. Finally, unlike the select committee setup by former Speaker Thom Tillis which was focused on ramming through the idea of using Public Private Partnerships which helped give birth to the I77 project, this new committee covers a broad expanse of transportation issues and has a lot more members. It is hard to see his committee getting to the point of suggesting ways of killing the I77 project any time soon. Raleigh, NC – Today, Speaker Tim Moore (R-Cleveland) announced the House Members who will serve on the newly formed House Select Committee On Strategic Transportation Planning And Long Term Funding Solutions. The Committee will have the authority to look at a number of issues including, but not limited to, current and future transportation projects, such as the I-77 managed lanes project or the I-95 corridor improvements. The Committee may also study port modernization, rail access, technological advancements in infrastructure construction, autonomous vehicles, and the impact our transportation network has on North Carolina’s global competitiveness and economic growth potential. The Committee will meet at the call of the Chair, and plans to hold its first meeting the week of December 14th. Davidson's "new" Town Board will be sworn in on Tuesday at the regularly scheduled December monthly meeting at 6pm. Normally, the swearing in meeting for a new Board is nothing but formality and completing required actions such as appointing committee assignments, electing Mayor Pro Tem, etc. New work is not typically started or old work finished. That's particularly true if there are new Board members who might need some ramp up time, or to even just let them "enjoy the moment." 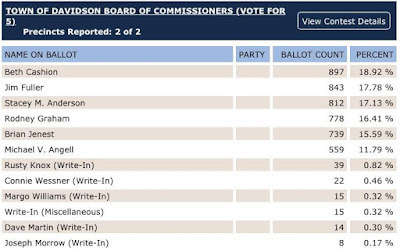 But since Davidson's "new" Board is the same as the "old" Board, that's not the case this time. Instead, they are charging right ahead with what will likely be the most controversial topic for the town in the next term. At the pre-meeting scheduled for 5:30, the Board will discuss its next steps on the Catalyst Project. The agenda item includes a full court press communication plan for soliciting feedback. 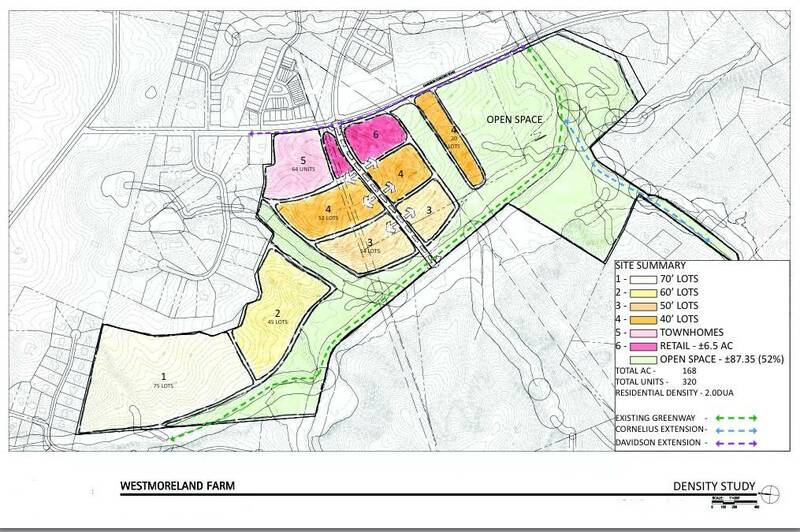 It looks like it incorporates some of the suggestions heard at previous info sessions. That's a good thing. However, knowing that certain town staff are fully behind the project, citizens need to definitely keep their attention on this topic and look at the information presented with a critical eye. See here for the details on the next 3 months. Things are about to start moving quickly, so those interested in this topic need to get ready to participate. The Board of MI-Connection, the cable company owned by the towns of Davidson and Mooresville met last week to hear the latest numbers on its operations . Fortunately, while the company is still a long way from being profitable, the numbers are at least headed in the right direction. A press release provided by Christina Shaul, Davidson’s Public Information Officer provided the following positive news. “April Bell of auditing firm Dixon Hughes Goodman shared results for the fiscal year that ended June 30, 2015. She stated that MI-Connection is seeing a very positive trend in financial results. That’s definitely what taxpayers who have been subsidizing the company want to hear, rather than things are headed in the opposite direction. It is validation that the operational improvements at the company over the past few years are paying off. The release went on to say MI-Connection will soon offer whole-home DVR, the ability to stream content on any iOS or Android device, and the ability to remotely program your DVR. Again, that's good to hear, but those are new services for the company, not new to the industry. As a small company, innovation will always be the company’s Achilles heal. A recent telecom industry announcement exemplifies that and should hopefully ensure the political decision makers keep their eye on the ball and continue working to get the company ready for sale at some point in the relatively near future. The impact of this recent announcement actually was foreshadowed here locally a few years ago. Back in 2011, I remember sitting at a political event in Davidson just as election season was ramping up. Davidson Commissioner Rodney Graham, was making some comments about Mi-Connection. Graham had made an unsuccessful attempt at the Board in 2007 as one of the few candidates at the time to question the idea of the town getting to the cable business. He was getting ready to make what would be a successful run in 2011. At that meeting I remember Graham holding his phone in the air and talking about some day being able to get internet speeds over wireless that rivaled what one could get from a cable company. That would be the day things started to look much more difficult for the municipally owned cable operation. Well, that day may have quietly gotten a significant step closer with an announcement by T-Mobile three weeks ago for its new "Binge On" service. While wireless phone carriers can't offer data speeds that match the newest offerings being rolled out traditional cable companies – including Mi-Connection’s, the newest 4G LTE wireless networks offer speeds sufficient for high quality video streaming as well as many other uses. The one drawback has been the cost of streaming lots of data over these wireless networks – until now. T-Mobile’s “Binge On” product removes that barrier by allowing unlimited DVD quality video with the purchase of a minimum wireless data package. All of the top name streaming services such as Netflix, Amazon, and Hulu are available with “Binge On” as well as Sling TV which offers many of the top live TV channels including ESPN. Now, a customer can become truly mobile with their video, voice, and data all coming from a single provider, and that provider is not the traditional cable company. Are there drawbacks and limitations to going fully wireless? Yes, there certainly are. If you are into lots of gaming or have other high-bandwidth needs for business uses, going completely wireless may not be for you – today. Long-term this type of continued change in technology could make it a different story. Commissioner Graham was holding his phone at that meeting just four years ago. What will things look like four years from now. Hopefully, our current crop of political leaders won't make us find out. Ran out of room for this in the version for the Herald Weekly. Not only will MI-Connection be facing more competition from new technologies in the future, but they will also have to go head-to-head against Time Warner. In a conversation with the developer of a large new neighborhood underway in the MI footprint, it was made clear that both MI and TWC have been offered the opportunity to supply service to the new neighborhood. The developer wished to remain anonymous because details had not been finalized. However, it does show that competition is going to be growing particularly around the edges of the MI footprint. How MI stands up to the challenge will be critical. New customers from new neighborhoods have been critical to the company's recent growth in subscribers. 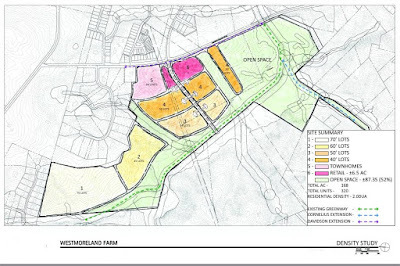 The Langtree development at Exit 31 would be the prime example. Can the company continue attracting large numbers of new customers in these neighborhoods if it has to face real competition with relatively unlimited resources? That will be the big question going forward. #NCGA House-92: It is ALL about the HOT lanes. At least that is what you would think from looking at Democrat challenger Chaz Beasley's website. The only issue mentioned on his campaign site home page is his opposition to I-77 HOT lanes project. Beasley says he intends to file this Thursday at 12:15 p.m. according to his Facebook page. He will be the first challenger for incumbent Republican Rep Charles Jeter of Huntersville who currently holds the seat. Beasley repeatedly says "we" have opposed the HOT lanes project since the beginning. However, it is a bit unclear exactly what Beasley means by "we". A search of the Exit 28 Ridiculousness Facebook page does not show a single comment by Beasley nor does one find anything else where he is on the record as opposing the project or has worked at all with the groups of activists trying to stop it. That would include on the sites for the Mecklenburg Young Democrats where Beasley served as the immediate past president - a position that would have allowed him a platform to espouse his supposed opposition. Regardless, his emphasis on the project shows the importance of it as a campaign issue. 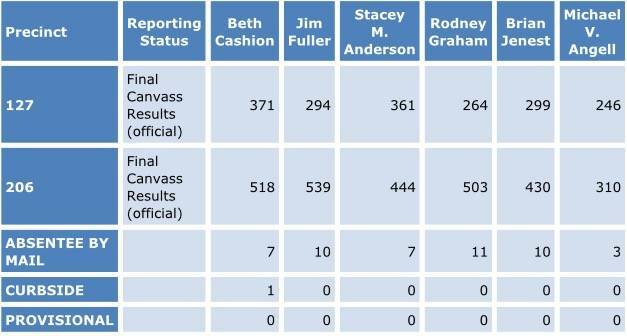 NC-92 is one of the few competitive districts between the parties in the entire state, so any number of issues could swing the election to one party or another. If voters believe that Jeter is not doing absolutely everything possible to stop the project, then it could cause enough voters to swing to Beasley simply because he says he opposes it. Proof of Beasley's actual opposition may not be required.